Jasmin is a vine-like plant, commonly used as a creeper over trellis and fences alike. 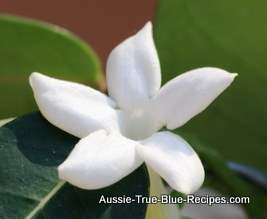 It is well known for it's mass of white flowers and beautiful scent. In cake decorating, it is very commonly used as a "filler flower" in between larger flowers such as roses and orchids. I have done several christening cakes over the years, decorated entirely with small filler flowers, jasmin being my first choice every time. 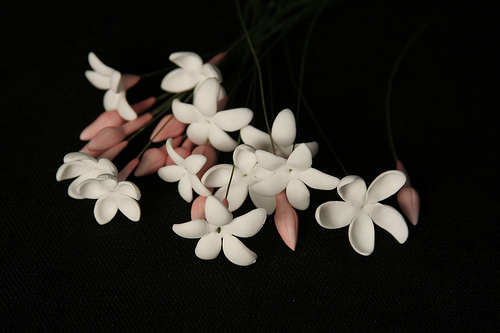 Roll your moulding paste very thinly, and use the jasmin cutter to cut out the flower. Place the cut out flower face down on soft foam, and curl each petal by pulling a small ball tool gently from the tip of the petal towards the centre. You will notice that this causes the petals to curl slightly backwards. Turn the flower over gently, and press in the middle to cup the flower. While the flower is still soft, dip a white stamen in your flower glue and insert into the centre of the flower, twisting it slightly as the head goes into the icing. Stand in florists foam to dry. 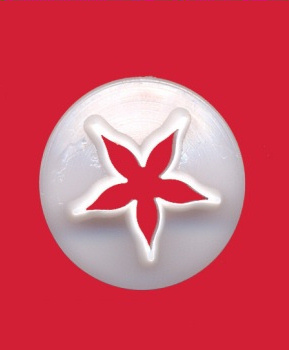 Once the flower has dried, thin some royal icing with a drop of water and paint it on the back of the flower, and a little way down the stem to create a tubular look. Once dry, use a pale pink chalk colour to colour the back of the petals and the tube. Lastly, use some royal icing that you have coloured green to paint on a small calyx at the base of the tubular portion of the flower. Dust your jasmin with white chalk and steam by holding over a boiling kettle for no more than a second or two.